The risk of living in the present moment is that you may make choices that don’t add up with your prior plans, or with your perception of yourself. And as a result, you would need to evolve. 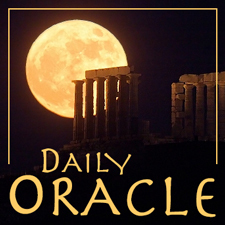 Today’s Oracle takes us to the Virgo weekly for May 26, 2006. The risk of living in the present moment is that you may make choices that don’t add up with your prior plans, or with your perception of yourself. And as a result, you would need to evolve. Most people find it easier to live in the past, and as a result, take very few risks, while preserving a self-concept they may have outgrown many years ago. You’re starting to see that you have a clear agenda, one that’s different from anything you’ve aspired to in the past. Notice that it’s worth acting on sooner rather than later. As we go deeper into this most unusual and challenging phase of history, intelligence is the thing we need the most. That is the theme of the 2019-2020 annual edition of Planet Waves — audio now available for instant access. See more information here. If you’re looking for individual signs, order here.